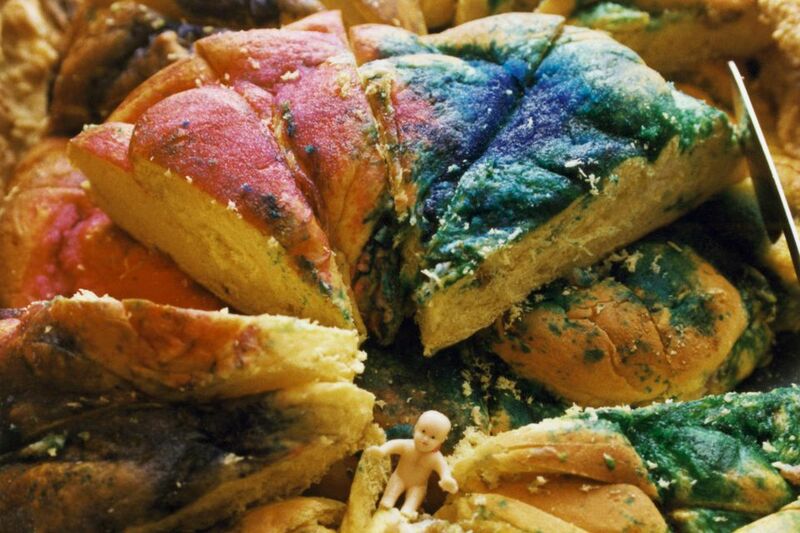 This basic Louisiana King cake is made with a rich brioche dough. If possible, use a stand mixer with paddle and dough hook attachments to mix and knead the dough. The king cake is made for Louisana's carnival season which ends with the Mardi Gras. According to legend, whoever finds with hidden bean, coin, or figurine will have good luck. Combine flour, sugar, nutmeg and salt in mixing bowl. Stir in lemon peel. Make a well in center and pour into it the yeast mixture and milk. Add eggs and egg yolks, and with a large wooden spoon gradually incorporate dry ingredients into liquid ones. Beat in butter and continue beating until dough forms a ball. The mixing and kneading can be done in a stand mixer with the paddle attachment and dough hook. Place the dough on floured board and sprinkle with more flour if necessary to keep from sticking to the bowl or surface. Knead by hand or with the mixer with the dough hook attachment until smooth and elastic. Brush inside of large bowl with 1 tablespoon softened butter. Set the dough in bowl and turn it to coat the entire surface with the butter. Cover the bowl and set aside for 1 1/2 hours or until doubled in bulk. Brush a large baking sheet with remaining butter. Punch dough down on lightly floured surface. Knead for a few minutes, then pat and shape dough into a long roll about 14 inches long. Place on baking sheet and form into a circle. Brush with the egg and milk mixture. Press bean or doll into dough so that it is hidden. Set aside again to rise for about 45 minutes to 1 1/4 hours, until doubled. Position an oven rack in the center of the oven. Heat the oven to 375° F (190° C/Gas 5). Bake the cake for 25 to 30 minutes, or until golden brown. Slide the cake onto wire rack to cool. Vanilla Glaze: In a small mixing bowl combine 1/2 cup sifted confectioners' sugar with 2 teaspoons milk and 1/4 teaspoon vanilla. Stir until smooth; drizzle over cake. Sprinkle the cake generously with the colored sugars then embed the candied fruit "jewels" in the King's "crown."